Swaziland Stock Exchange (SSX) is a stock exchange located in Mbabane, Swaziland. Founded in 1990, this small but thriving stock exchange facilitates trading in handful of listed public companies, listed government stock options, listed debentures, government guaranteed stock and non trading mutual funds. SSM Index is the main benchmark index of the Swaziland Stock Exchange which tracks the performance of all listings on the exchange. With just, 7 companies listed on the exchange, it is one of the worlds smallest stock exchanges. 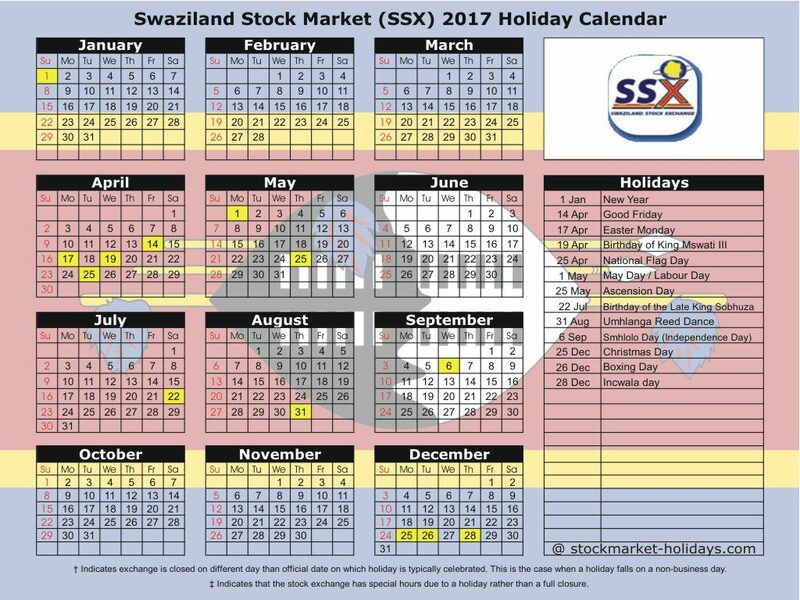 If you are from Swaziland or if you are trading in Swaziland Stock Market, then I am sure you might be searching for Swaziland Stock Market Holidays, Swaziland Stock Market Trading Calendar. Below we have provided Swaziland Stock Market 2017 / 2018 Holiday Calendar. Note : Swaziland Stock Market 2018 Holiday Calendar Coming Soon. Note : Swaziland Stock Market 2018 Holidays List Coming Soon. Note : Swaziland Stock Market 2018 Holiday Calendar PDF Download Coming Soon. Live Quotes and Charts, Company Profile, Results, Corporate Announcements and all other information of all the securities trading on Swaziland Stock Market will be available on official website of the exchange.